The Colchicums are blooming. They are a wonderful introduction to Autumn as they appear by mid September in my part of the world. What Do They Look Like? 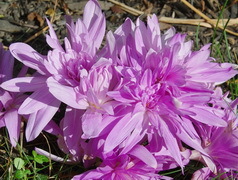 Colchicum autumnale are large autumn flowering bulbs in various shades of mauve or white and I appear to have double and single flowered cultivars. They are members of the Lily family and are occasionally, incorrectly, referred to as autumn crocus. 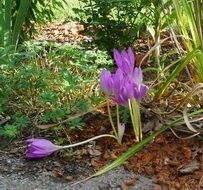 There are several species of Crocus that bloom in the autumn but they are members of the Iris family and usually bloom much later and smaller than the Colchicum. Do They Increase? The group of flowers in the picture above, arise from a single bulb that has been in the ground for 2 - 3 years. These large bulbs are an excellent investment and when you see the size of them and the price you will understand why I referred to them as an investment. Buy them as soon as possible in the fall before they start to bloom in the box at the garden centre. Each of those white shoots will produce at least one flower. 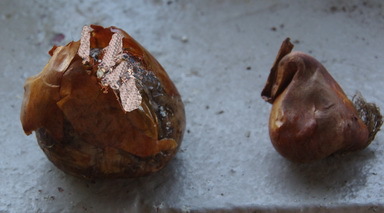 The smaller bulb is the white flowered variety. Leaves Appear When? Next spring, after you have forgotten where you planted them, a cluster of long, light green leaves will appear and persist for some time. Encourage them as they are making the multiple blooms for next year. These bulbs will last and increase for many years and they appear to be unattractive to squirrels. 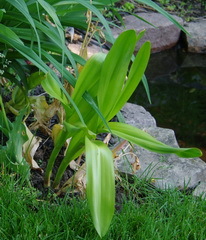 I have had these bulbs stay in the ground and not bloom or grow obvious leaves for a couple of years and then reappear but that would be unusual behaviour. Are They Useful? A pharmaceutical drug used for gout according to my old references,) is derived from this plant and the active ingredient colchicine (C25H22NO6, for those of you might care) is also of great interest to plant breeders. It is used to induce mutations in various plants and the results may lead to new and useful cultivars. If you want to appear knowledgeable, when someone shows you a mauve autumn flower and calls it a Crocus; look carefully inside and count the six stamens and then correct them. 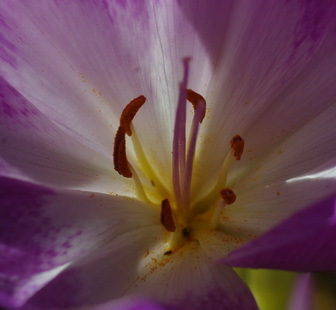 Crocus have only three stamens. Of course you botanical wizards already knew that when I told you which family they belonged to.